Kairouan (Arabic: القيروان‎‎ Qeirwān, also known as al-Qayrawan), is the capital of the Kairouan Governorate in Tunisia. It is a UNESCO World Heritage site. The city was founded by the Umayyads around 670. In the period of Caliph Mu'awiya (reigned 661–680), it became an important centre for Sunni Islamic scholarship and Quranic learning, and thus attracting a large number of Muslims from various parts of the world, next only to Mecca and Medina. The holy Mosque of Uqba is situated in the city. The name (Arabic: القيروان‎‎ Al-Qairuwân is an Arabic version, of the Persian word کاروان kârvân, meaning "military/civilian camp" (kâr [war/military] (akin to Latin guer, + vân [outpost]), "caravan", or "resting place" (see caravanserai). The foundation of Kairouan dates to about the year 670 when the Arab general Uqba ibn Nafi of Amir Muauia selected a site in the middle of a dense forest, then infested with wild beasts and reptiles, as the location of a military post for the conquest of the West. Formerly, the city of Kamounia was located where Kairouan now stands. It had housed a Byzantine garrison before the Arab conquest, and stood far from the sea – safe from the continued attacks of the Berbers who had fiercely resisted the Arab invasion. Berber resistance continued, led first by Kusaila, whose troops killed Uqba at Biskra about fifteen years after the establishment of the military post, and then by a Berber woman called Al-Kahina who was killed and her army defeated in 702. Subsequently, there occurred a mass conversion of the Berbers to Islam. Kharijites or Islamic "outsiders" who formed an egalitarian and puritanical sect appeared and are still present on the island of Djerba. In 745, Kharijite Berbers captured Kairouan, which was already at that time a developed city with luxuriant gardens and olive groves. Power struggles continued until Ibrahim ibn al-Aghlab recaptured Kairouan at the end of the 8th century. In 800 Caliph Harun ar-Rashid in Baghdad confirmed Ibrahim as Emir and hereditary ruler of Ifriqiya. Ibrahim ibn al-Aghlab founded the Aghlabid dynasty which ruled Ifriqiya between 800 and 909. 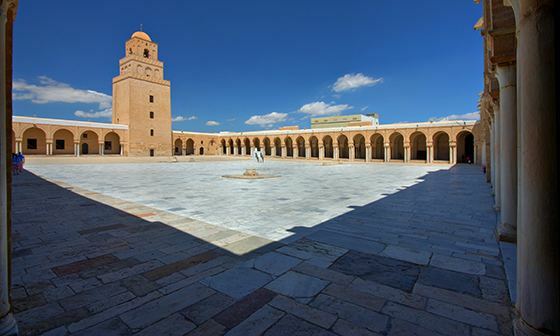 The new Emirs embellished Kairouan and made it their capital. It soon became famous for its wealth and prosperity, reaching the levels of Basra and Kufa and giving Tunisia one of its golden ages long sought after the glorious days of Carthage. Jews were among the original settlers of Kairouan, and the community played an important role in Jewish history, having been a world center of Talmudic and Halakhic scholarship for at least for three generations. The community disbanded in 1270 CE when the Hafsids forbade non-Muslims from living in the city; the remaining Jews were forced to convert to Islam or to leave. 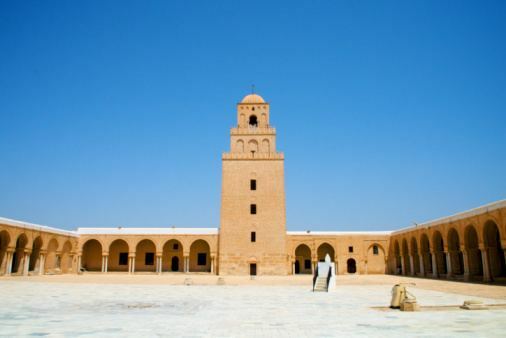 A unique religious tradition in Kairouan was the use of Islamic law to enforce monogamy by stipulating it in the marriage contract, a practice common among both elites and commoners. This stipulation gave a woman legal recourse in the case that her husband sought to take a second wife. Although the introduction of the 1956 Code of Personal Status rendered the tradition obsolete by outlawing polygamy nationwide, some scholars have identified it as a "positive tradition for women within the large framework of Islamic law."